One of the biggest risks of doing a trip like this is the van playing up. Choosing to do it in a vehicle that’s near-nuff a quarter of a century old was never going to minimise that risk. As the driveshaft saga so eloquently demonstrated, when the vehicle’s out of commission, you temporarily lose access to everything you can’t relatively easily carry in a bag. You can’t cook, dress or sleep in a hire car – and you’re at the mercy of somebody else. My opinion of the majority of the motor trade has never been particularly high, with plenty of examples of personal experience to fall back on as proof, and that’s before you add in the extra complexity of linguistic issues. However, the biggest benefit of a vehicle of this age (purchase budget aside) is that it’s not chock-full of the kind of technology which means that servicing requires a diagnostic computer. When something has a little sulk, it’s almost certainly going to be due to a fault that we can diagnose and probably even fix without too much ado. 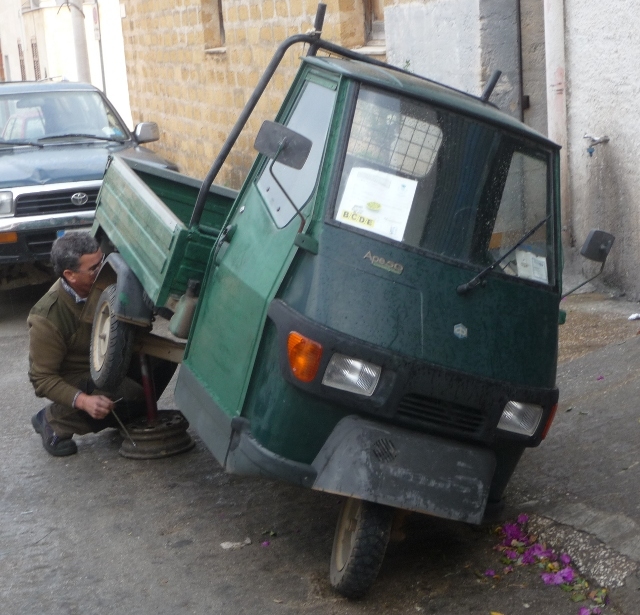 So, when the exhaust – which wasn’t in the first flush of youth when we bought the van – started to blow not long after we arrived on Sicily, there wasn’t too much of a melodramatic response from us. After all, given that we’ve been giving the poor ol’ dear so much use this last few months, it’s been behaving really quite well. I managed to shut the exhaust leak up by wrapping the offending joint firmly with a bodge-bandage. That was never going to last long, though, since the leak was well forward in the exhaust – so a lot of heat, and a fair bit of gas pressure at work. 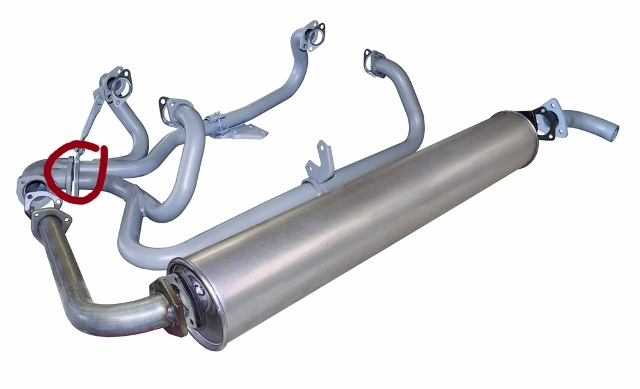 The exhaust on this van has two pipes coming from the engine itself, one from the front and one from the rear pairs of cylinders, joining at a 2-into-1 which also acts as a 90degree elbow, taking the gases to the main silencer across the back of the van. 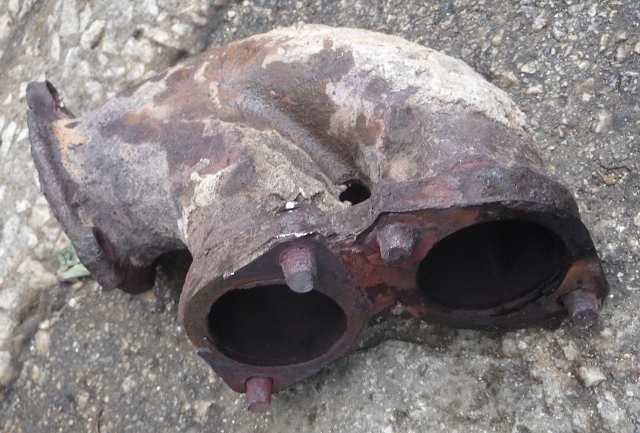 The leak was from the gaskets sealing the two pipes going into that elbow. When it started to blow again as we left Palermo, there was only one real option. A new exhaust. And that’s one of the reasons we’ve been sat at San Vito for a while. 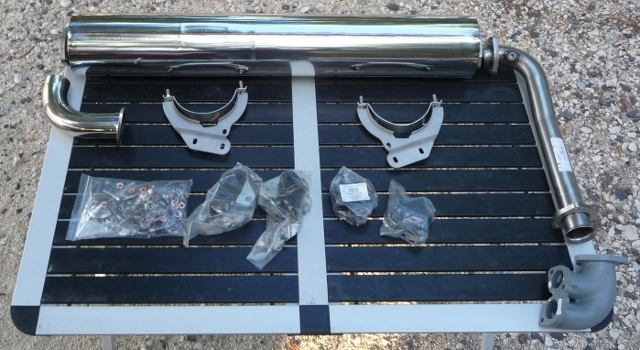 As well as the exhaust, we’ve been waiting for several other parts for the van to arrive. Then, once they did, it was time for me to get busy with the toolkit. Buying the exhaust was the first challenge, of course. Order something up locally, or get it from a known-good source, but with the extra shipping costs? In the end, I didn’t even bother trying to get prices locally. I’m not sure my Italian would have been up to it, and we’d have certainly ended up with the usual ho-hum quality, fits-where-it-touches, mild steel system that would only have lasted a handful of years. Brickwerks do a full stainless system that was reputed to be excellent. In addition, close inspection revealed that we didn’t need the full lot – the first pipes in the system, going from the engine’s cylinder heads, weren’t quite at death’s door. Just as well, really, since the bolts holding them to the engine were utterly past-tense, and the job would probably have required the engine to be removed to allow them to be drilled out and the threads in the holes made good again. It also became obvious that the bracketry holding the main silencer up was a bit historical. That was another tip in favour of a specialist source, since they’ve remade those in stainless. If you’re going to do a job, best to do it once. Then there’s the “whilst you’re in there” bits. Since the main engine mountings are only accessible with the exhaust off, it made sense to order a set of those at the same time. Once a large and heavy box arrived, it was time for battle to be commenced – and the first victory wasn’t long in coming. A quick bit of effort with a trusty junior hacksaw saw old bolts severed and all of the old exhaust from the elbow backwards hit the floor. Yes, the elbow backwards. The offending joint itself was still firmly intact. And so on to that exhaust elbow. There’s four bolts hold it to the pair of front pipes. Being subjected to road spray as well as a lot of heat, they were, of course, very definitely ex-bolts, with not one actual corner between any of their heads. Time to cut them off, too. The lower pair went reasonably easily. The upper pair, though… Nope. Not happening. Not with the tools I had with me. I just couldn’t get any kind of purchase with the saw blades onto them, because they were just so inaccessible. Still, at least I’d got to a point where things were no worse than they were before – all of the new rear exhaust could be fitted properly, leaving one joint (with nice new bolts) to easily redo when the offending elbow itself could be replaced. Reassembly, in the immortal words of the Haynes manual authors, is the reversal of the removal procedure. Or something. It’s quite obvious that they’ve never attempted to get a bolt slid into place, then a washer and nut fitted onto it, sight unseen, by fingertips at the end of a tiny gap, whilst lying on their sides on sharp gravel, with near-on 15kg of exhaust’s weight supported along the length of one leg raised in a parody of an aerobics pose – and all with a cat sat on top of them. Lucky sods. In the end, there was no other option but to take the recalcitrant last bit away to meet a man with power tools at his disposal. The local garagiste in San Vito spent a couple of hours underneath, with a mix of angle grinder and air-powered die grinder. Even when he did manage to remove the old elbow, it wasn’t as straightforward as it could have been, with the mounting flanges needing a fair amount of work before there was any chance of the seal remaining gas-tight for long. Remember I said I didn’t have a high opinion of the motor trade in general? A few more experiences like this, and I could change that opinion. Even better, there was the entertainment of learning a bit about Ape-fixing. It seems you don’t need a jack, merely an old car wheel with a length of steel pole welded to it as a prop. Just grab one rear corner, heave, tip, and stuff the prop underneath. But I digress. The end result? Excellent. The exhaust itself is as good as reputed, and the replaced mounts have made a big improvement to the way the van drives. The gear change is much better, and there’s a lot less slop and judder as you move away or trickle along very slowly. That, of course, was just one of the jobs needing to be done. You may remember that at Torre Salsa, the fridge had stopped working on mains. At Palermo, I took the fridge out of the van, and proved that it was indeed just the electric heater element that had died of old age. So, with a new one to hand, out came the fridge again. Once it was back in, a drawn-out period of waiting had to be endured to see if it was properly cooling again. It was… A cold beer proved the fact. Another proved it again. Finally, we were thoroughly convinced – and out of beer. Other minor problems had also come to light during the trip. Back in the summer, we’d started having problems with the sink tap not always working. Because the water tank’s lower than the sink, there’s no water pressure – so the tap switches on an electric pump. Or, rather, it should. The small switch inside the tap had started to get tempramental. Sometimes it’d work first time, sometimes you’d have to open-and-close the tap five or six times to get it to work. Fiddling with it didn’t seem to produce an improvement which ever lasted long, so it wasn’t a great surprise when an attempt finally resulted in the switch’s innards falling apart completely. At least a quick and easy work-around could be made by adding a separate electric switch (bought from a local supermarket). It meant we had reliable water in the sink again – but wasn’t a great long-term solution. So, again, advantage was taken of a consistent address to order a replacement from another specialist, in Germany. Most motorhome taps are not only crazy expensive, but are either way too big to fit under our cooker lid whilst closed or designed for both hot and cold water – we only have cold. Then there was the battery charging… All the time the van’s plugged in to mains electricity (and, yes, I’ve also had to replace the socket on the outside of the van, since the lid started to wobble around on only one hinge pin, as well as randomly opening and flapping whilst we were driving) it should be charging both batteries. However, it wasn’t – and after more than a few nights in one place, we kept having to jump-start the van from its own second battery, a quirk in the wiring meaning that the stereo and interior lighting took their power from the same battery used to start the engine – leaving the second battery with virtually nothing to actually do. Once that was changed over, via a small modification to the van’s wiring, it became increasingly obvious that neither battery was being charged – as the lights still dimmed to nearly nothing after a few nights of use. Replacing the charger had a stack of other benefits, though – not only is the new one MUCH smaller than the old (a big bonus when you see how squished in everything is in all of our storage space), but it’s a much cleverer charger – meaning that the battery should last a lot longer before needing to be replaced. So we should – he says hopefully – be set fair for the next leg. There’s always the risk of tempting fate by saying that, of course, so cross your fingers for us. There is, inevitably, still a list of jobs to do on the van – but there’s nothing major that we can think of at the moment. And, anyway, what else is a breakdown but an excuse to meet new friends and get some new material to blog about…? Now, if you’ll excuse me, I’ve just got a couple of bolts to check and the front spoiler to tape back together again. Happy New Year! Keep the blogs coming. Happy New Year from the shaky isles with long white clouds.